From “asylum” to “undocumented,” learn what these terms mean legally and politically. 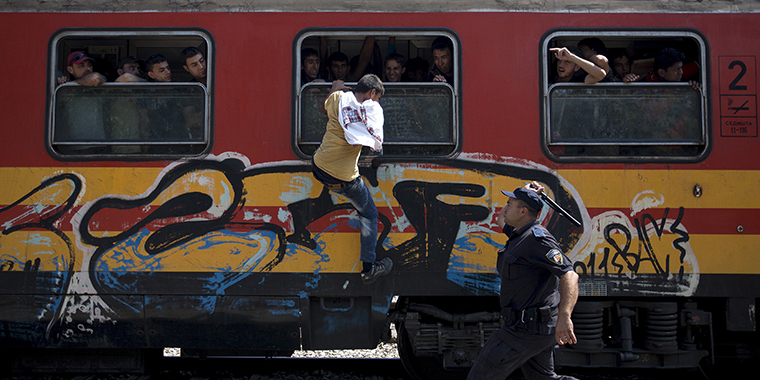 A policeman tries to stop a migrant from boarding a train through a window at Gevgelija train station in Macedonia, close to the border with Greece, on August 15, 2015. People who move from one country to another are international migrants. This umbrella term covers both economic migrants, who leave home seeking economic opportunity, and refugees, who flee their home countries due to conflict or persecution and fear for their safety if they return. 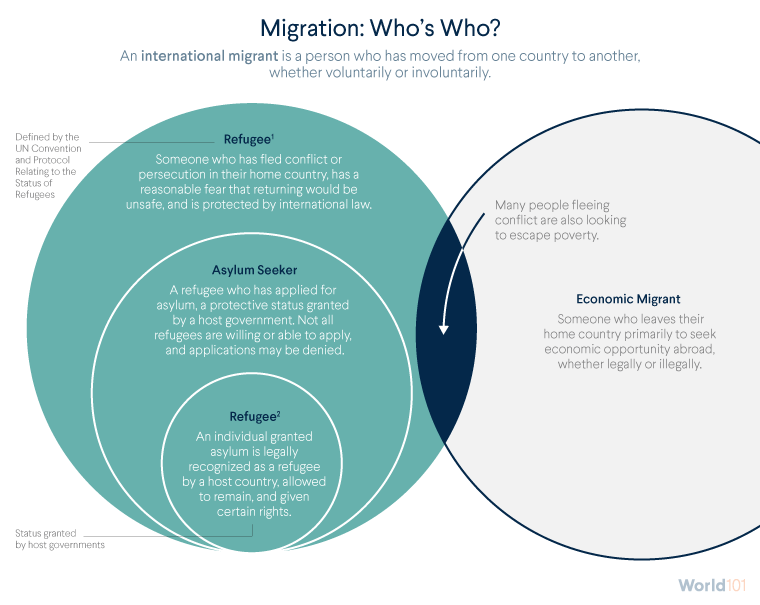 These distinctions are important because different migrants are entitled to different rights and protections from host governments and international organizations. At a time when migration is rising and immigration is heavily politicized, it’s important to understand what drives people to migrate and what their designations really mean. Economic migrants are seeking job opportunities abroad. Economic migrants, who account for the majority of the world’s migrants, broadly fall into two categories: those who are authorized to work in the country they migrate to and those who are not. In most cases, immigrants need permission to live and work in their new country. Many economic migrants obtain that permission by applying for a visa or going through other processes set up by the host country. Once granted permission, they enjoy some rights to live and work in the host country. When people migrate to a country without the permission or authorization of that country’s government, they can be deprived of those same rights and find themselves in precarious situations. These migrants are called by different names, often for political effect: undocumented immigrants, irregular migrants, and illegal aliens. Who decides which migrants receive refugee status? While the distinction between economic migrants with and without work authorization is straightforward, the line between an economic migrant and a refugee is often blurred, since many people fleeing conflict often are also looking to escape poverty. To complicate matters, governments, international organizations, and communities often disagree on who counts as a refugee. This can result in the uneven treatment of refugees worldwide. owing to well-founded fear of being persecuted for reasons of race, religion, nationality, membership of a particular social group or political opinion, is outside the country of his nationality and is unable or, owing to such fear, is unwilling to avail himself of the protection of that country; or who, not having a nationality and being outside the country of his former habitual residence as a result of such events, is unable or, owing to such fear, is unwilling to return to it. Although 145 nations agree to this definition, host governments ultimately get to decide whether to recognize someone as a refugee—through the process of granting them asylum. Refugees and asylum seekers are fleeing for their safety. Refugees and asylum seekers together account for only 10 percent of global migrants. The distinction between these two, though seemingly small, makes a big difference in how they are treated by governments and international organizations. When migrants request that a host government recognize them as a refugee, they are called asylum seekers. If the host government grants those migrants asylum, they are referred to as asylees and receive the protection that comes with an official refugee status, which may include the right to work, access to education and health care, and the rights and freedoms afforded to citizens and legal residents of that country. Sometimes, however, governments distinguish between refugees and asylum seekers in different ways. For example, the U.S. government distinguishes refugees from asylum seekers and asylees based on where and when they apply for protective status. Refugees, according to the U.S. government, are located outside the United States at the time of application; asylum seekers, on the other hand, apply when they arrive at the U.S. border or shortly thereafter. By contrast, the United Nations considers migrants who flee war and persecution to be refugees, regardless of whether they have requested or been granted asylum by a host country. That means, for example, that the United Nations grants fleeing Syrians and Eritreans refugee status prima facie, or automatically. Seeking asylum is a difficult process. 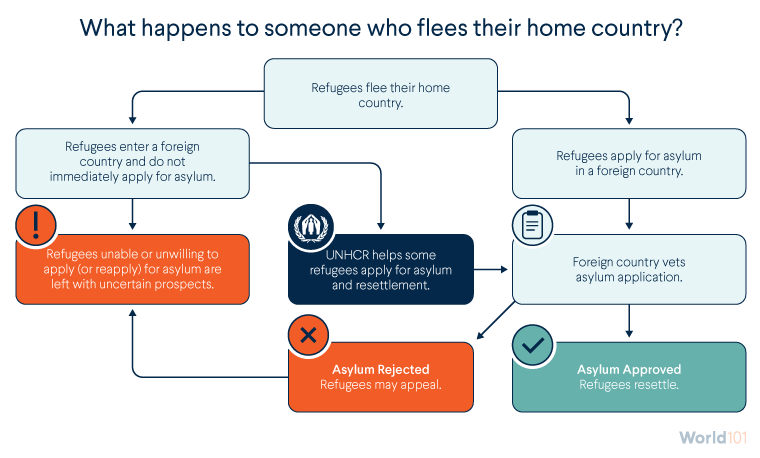 Every migrant, regardless of whether they entered a country legally, has the right to apply for asylum, but the application process—including how to apply and in which country—can be difficult, confusing, and time-consuming. Some countries, such as the United States, Canada, and most European Union (EU) member states, require people to apply for asylum in the first (or first safe) country in which they arrive. However, some countries, such as Sweden, have waived the first-entry rule, signaling a willingness to take in refugees who arrive in another country first. This can create a “hot potato” effect in the EU, whereby the first country to receive refugees tries to quickly pass them on to another. For example, Croatia announced that it would not take asylum seekers but instead reroute them to Sweden. In yet another example of international negotiation, the EU and Turkey struck a deal in 2016 that would allow the EU to send back “all new irregular migrants” who entered Greece through Turkey. In exchange, the EU agreed to grant Turkey economic aid, allow visa-free travel to most of Europe for Turkish citizens, and, for each returned Syrian from Greece, accept one Syrian refugee from Turkey who hadn’t already tried to enter the EU. What happens to refugees if their asylum claim is denied? 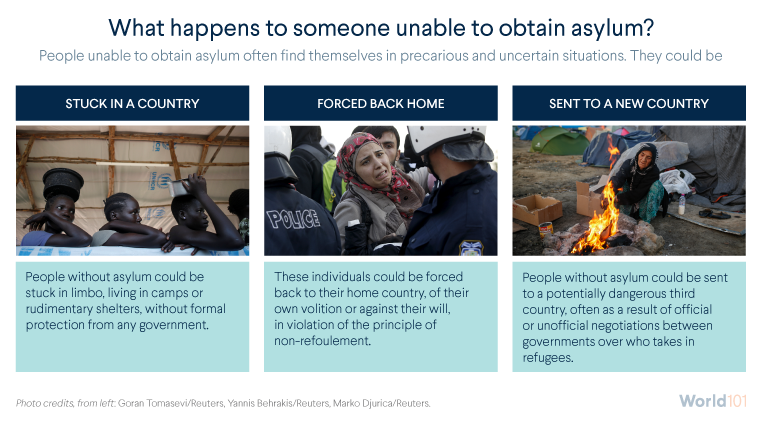 Whether for political, economic, or other reasons, host countries deny many asylum seekers’ applications, leaving them with few options. These refugees remain in limbo, go back to their home countries, or head to a new country. 1. The Safe Third Country Agreement was signed in 2002. View the full text here: https://www.canada.ca/en/immigration-refugees-citizenship/corporate/man…. It lays out the terms of asylum demands (referred to as "refugee status claims") between the United States and Canada as well as four exceptions. For example, if you're an unaccompanied minor, you qualify for an exception to this agreement and may not be sent back. The full list of exceptions is here: http://www.unhcr.org/en-us/5952a3c54.pdf. Not every refugee applies for asylum. Assimilating into an entirely new country and culture can prove extremely difficult, so many refugees just wait to return home instead. These refugees—as well as those with pending asylum claims and others who are unable or unwilling to apply—often remain in refugee camps without the right to work and can face great insecurity and hardship. For refugees fleeing violence and persecution, an already precarious situation can become uncertain and dangerous on the path to asylum—and potentially even more so for those who do not seek, or are denied, that status.